Recently several entities in Arlington teamed up with the Santa Fe International Folk Art Market to bring the concept to Arlington. The Arlington show was held on the Green at College Park on the UTA campus earlier this month. Almost three dozen artisans from around the world had a chance to showcase their creations to North Texans and anyone else who showed up for the event. I had a chance to check it out a couple of hours before the market was due to close. I went out of curiosity, not with the intention of buying anything. 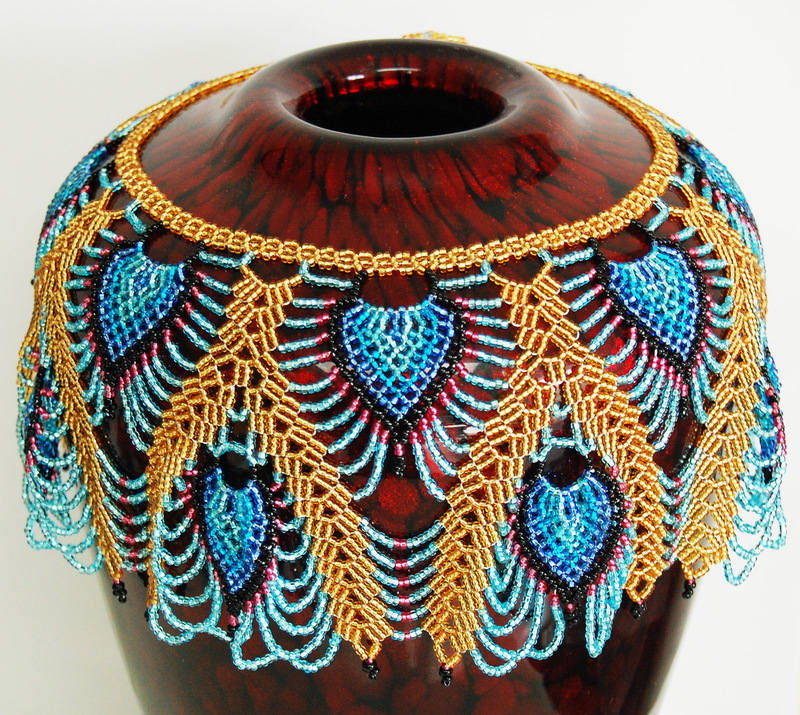 That changed when I saw the lovely seed bead work at the booth of La Mega Cooperativa Artesanal de los Saraguros. One necklace in particular caught my eye. It was a collar necklace beaded to look like it was made up of many peacock feather eyes. I decided to look around the rest of the market before determining whether to purchase the necklace or not. It was still there when I got back to the booth so I tried it on. I really liked it but I needed to think if I already had at least one thing in my wardrobe I could pair it with. 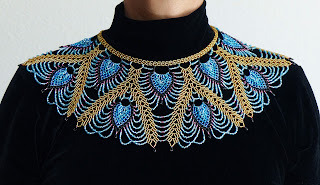 I decided the necklace should look stunning over a black mock turtle neck of mine. I was happy to make the purchase and help support this artisan coop. When I got home I tried it on with the shirt I was thinking of and had my husband take a picture of it so I could share it with my readers. When I took it off and was deciding where to store it, I was thinking it was a shame not to have it on display somehow to be able to enjoy it even when I was not wearing it. We have a large red blown glass vase that I thought of as a possible support. I draped the necklace over the vase and they complimented each other wonderfully. We both enjoy getting to see this wearable art more often by displaying it this way. The original Santa Fe International Folk Art Market is coming up the middle of July in, where else, Santa Fe, New Mexico. They will have many more international artisans there. If you happen to be in the area, it should be a fun event to attend. 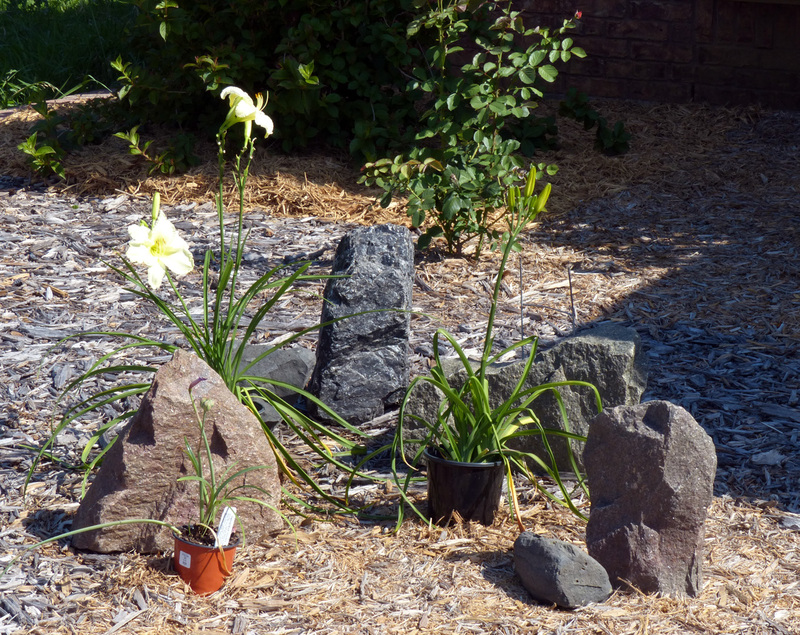 chance to finish chipping that area of my garden and start moving some other plants around, I decided where I would dedicate the space to a variety of daylilies. I have a few in other areas that will stay there but the two that I knew I put in temporary locations have a place to go to now. let their variety of blooms play off each other. 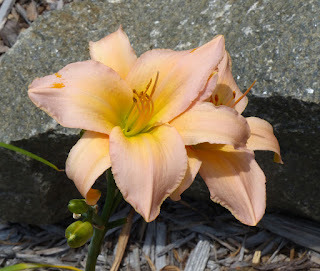 That would be very showy while they were in bloom but a bit boring the rest of the year. I needed another design element. This could have been garden art but my go to is often rock, so I took a trip to the local rock yard to see if anything jumped out at me. I found a nice piece of obsidian and some granite boulders with subtle color variations. I looked for stones that had a flat base for stability and settled on three small granite boulders of different shades and shapes. potted daylilies I had recently purchased and used a newly purchased rain lily and a sign stake as stand ins for the daylilies I will transplant later this year to ensure that I liked my rock placement. At this point I added a couple of small pieces of basalt that I had lying around. Soon I will tuck in the potted plants. There is also room for me to pick up a few more daylilies in the future that speak to me and sneak them into this area of the garden. Daylilies are a wonderful choice for many areas of the country. 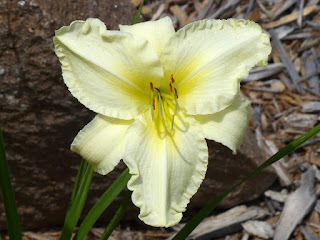 I have found most varieties to be very drought tolerant and reliable perennials in my garden. They even have varieties now that will rebloom so that you aren't limited to enjoying their beautiful flowers once a year. Sometimes a custom request comes in that is for a variation on something seen in my sold items in my EclecticSkeptic shop on Etsy. 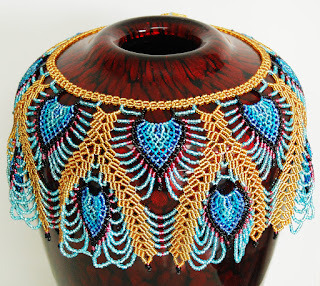 If I have what is needed to recreate a sold item or a variation on it, I am happy to help. 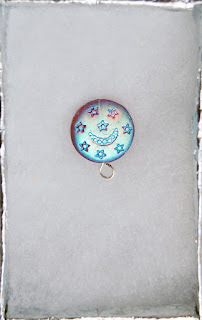 Someone contacted me because they had been searching for a bead much like I had used in my previously sold flying pig moon and stars pin but with a silver cast instead of a gold one. Luckily I had a few moon and star beads that I had not used yet, specifically because they lacked much of the golden hue of the ones I had paired with my golden flying pig charm. 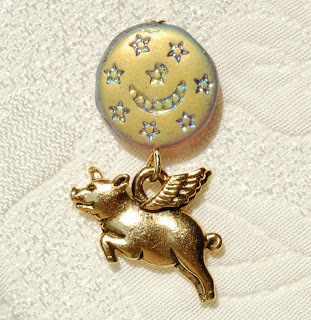 This person wanted to attach their own charm to such a bead, as I had attached my flying pig charm, and use the combination as a lapel pin. 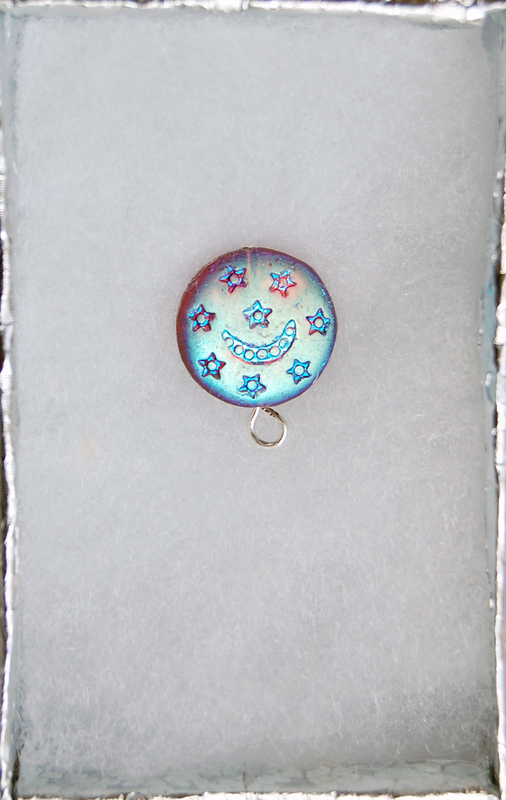 They wanted the loop under the bead to be sterling silver and the tie tack back to be silver tone instead golden. I had the materials on hand to be able to achieve what this person wanted so I was happy to be able to create a custom listing for her. If you see something in a current or sold listing that you want to know if I can recreate but make it a different size, color, style or other variation, please contact me. I enjoy tailoring my creations to exactly what someone is looking for when I am able. If you are a potter and you need a new backsplash in your kitchen that you are remodeling, what do you do? You make tiles of course! 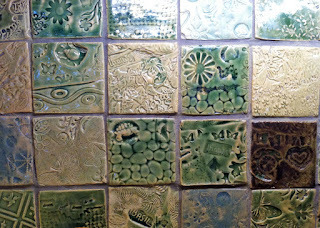 I got a chance to see the finished product earlier this year after having seen the tile pile grow from one visit to Cynthia's studio to the next. She had a lot of fun making a variety of tiles with different stamps and textures. The photos in this post show only a small portion of the varied tiles she made. The look is at once both uniform and individual. The colors of the tiles blend to give a unified palate and it is so much fun to look at all of the individual imagery on each tile. I don't think any two repeat exactly. 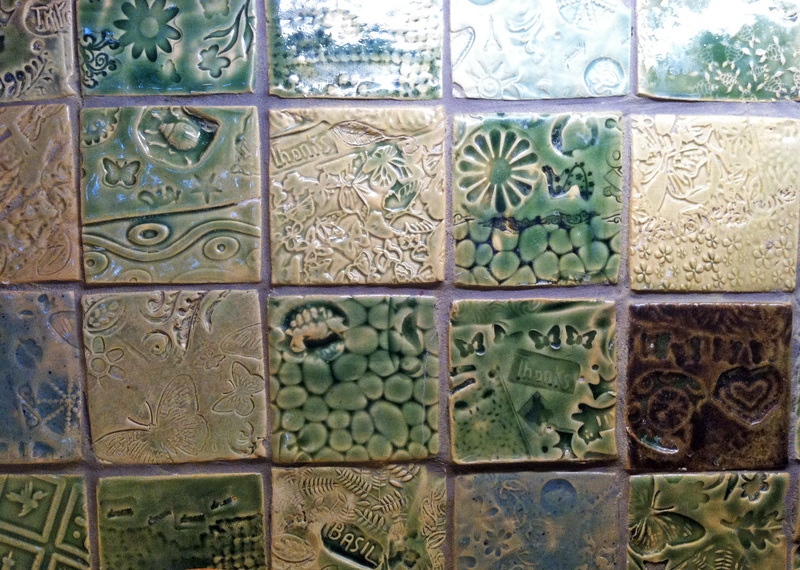 Tiles are a departure from the thrown pieces that comprise the bulk of the work Cynthia offers for sale. You can find her work on Etsy in her ClayBabies shop or at arts and crafts shows in the area and in some brick and mortar stores as CiCi House of Clay. You can see the bowl of hers that had to come home with me in an Artist Spotlight post from earlier this year. 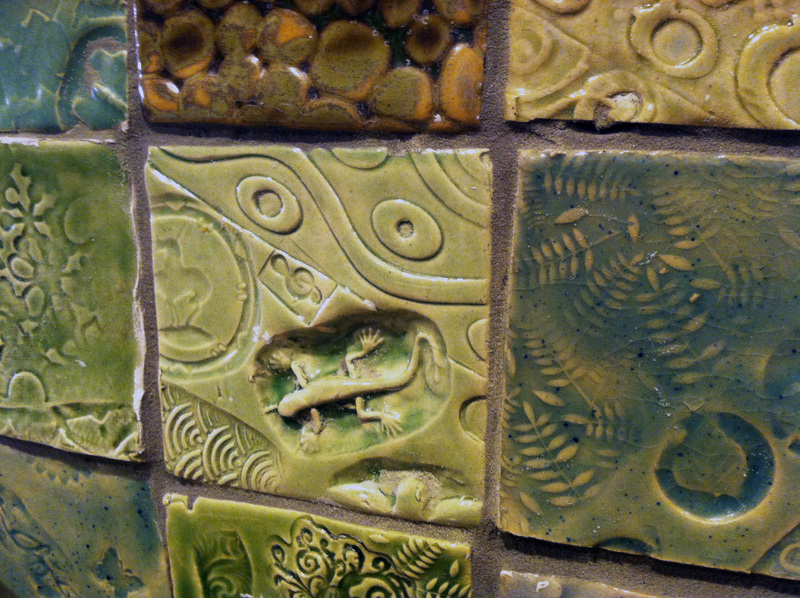 Most of Cynthia's pottery can be classified as functional art. She makes bowls, vases, teapots and much more.